The Toyota Camry is one of our larger sedans, making it ideal for some seeking that extra bit of space for the family or the extra comfort on the longer drives. I has ample space in the boot and plenty of leg room for passengers, it is also ideal for the family particularly for customers with children seats, with easy children seat mount points along the rear shelf. The vehicle also has the 2.4 l engine giving it that extra bit of power. Through Perth, we have been offering large hire cars as part of our rental fleet. These large sedan hire cars offer added room, power, and comfort to drive. They are ideal for longer journeys and families in need of a hire car, offering that extra space for children’s seats, strollers or passengers. 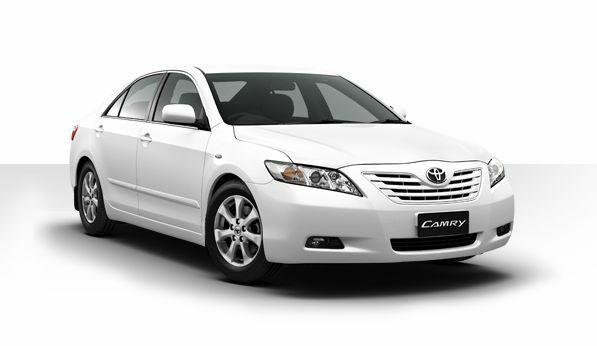 We offer four different large sedans hire car models, our medium size Hyundai Elantra’s and Corolla ascents which are perfect longer drives down to Marg’s or up to the pinnacles or our larger sedan the Toyota Camry’s. These larger sedan hire cars are great for families with children with the added space the car doesn’t seem so cramped. Below we have put together a table summarising the various large hire cars we have outlining the features and prices all at a glance, there is more detailed information below of our medium / large hire cars. Not big enough ? need more seats ? If our medium / Large hire cars are not big enough we also offer people mover hire. For more information on our people mover hire Perth please click here. The Toyota Camry is one of our larger sedans, making it ideal for some seeking that extra bit of space for the family or the extra comfort on the longer drives. I have ample space in the boot and plenty of leg room for passengers, it is also ideal for the family particularly for customers with children seats, with easy children seat mount points on the rear shelf. The vehicle also has the 2.4 l engine giving it that extra bit of power.